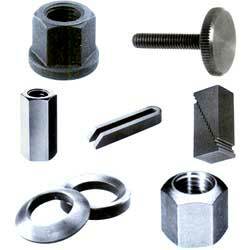 We offer high quality 8.8 grade Blackened Clamping Elements conforming to Indian and International standards. These elements include T Nuts, T Bolts, Clamping Studs, Strap Clamps, U Clamps, Washers, Spherical Washers & Conical Seats, Clamping Nuts, Flanged Nuts, Extension Nuts, Step Blocks, Support Blocks, Adjustable Height Plates, etc. These standard elements can easily be incorporated in jigs and fixtures and also can be used separately to clamp work pieces and dies, moulds on machines.